Embryo adoption donation New Zealand. Do you live in New Zealand and are you interested in adopting embryos so you can give birth to your adopted child? It may be possible even though you don’t live in the United States. In 1997, Nightlight pioneered the first embryo donation and adoption program in the world and named it the Snowflakes Embryo Adoption Program. This exciting adoption choice allows couples to donate remaining embryos and for others to receive them and give birth to their adopted child. All of the embryos matched with adopting families in the Snowflakes program were donated by families who originally created them for their in vitro fertilization (IVF) treatments. The embryos remain in storage until a disposition choice is made by the family who owns them. We encourage families to donate embryos for reproduction. Believe it or not, the miracle of giving birth to your adopted baby is possible. The Snowflakes Program makes it possible for you to adopt embryos from couples who have completed IVF treatments and have remaining embryos. These embryos are currently stored in fertility clinics and are waiting for a loving home. Prior to being matched with embryos, you will have an adoption home study. 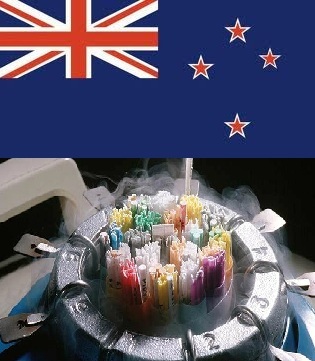 The Snowflake Embryo adoption program is available for people worldwide, including New Zealand. Nearly 600 babies have been born through the Snowflakes Program, and dozens of families are awaiting a loving couple to adopt their embryos. We invite you to explore our program information for adopting parents and contact us so we can help you determine if our program is the right fit for you. If you are interested in adopting embryos through Snowflakes, we require you to travel to the U.S. for your Frozen Embryo Transfer (FET) procedure. Please email Paige at paige@nightlight.org. We have a variety of recorded educational webinar topics you may find helpful as you consider placing your embryos for adoption. Donors share their stories. Learn about the very first embryo child. Watch a series about the entire process of embryo adoption. We understand the difficult decision parents are faced with when they realize they have embryos they don’t plan to transfer. There are programs in the U.S. which will allow you to donate your embryos for reproduction. You created your embryos with the full intention of giving them life. Embryo donation is the choice that gives your embryos an opportunity to live. If you are interested in donating your embryos there is an organization in Florida who is willing to work with international families with remaining embryos.